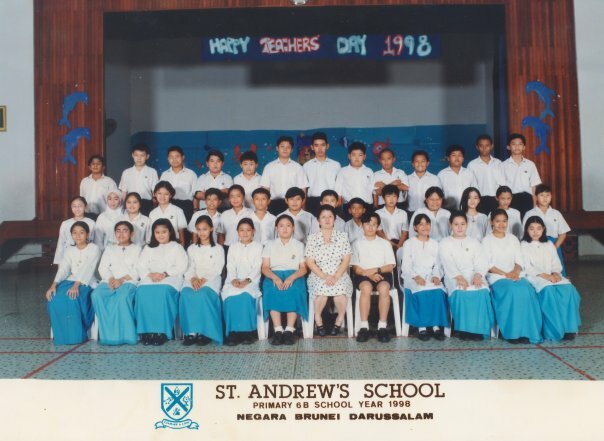 St Andrew's School, Class of 1B-6B, 1993 to 1998 with His Royal Highness the Crown Prince and Her Royal Highness Princess Sarah. Class of Primary 6B, 1998. I think I can safely assume all of us weren't actually planning on attending the event. I feel it's been 14 years since we left school, it's still somewhat too 'early' for any form of reunion. Plus, I still see a few of my classmates and teachers around and have many of them on social media so it doesn't really feel like we've actually lost touch. At least that's what I thought. 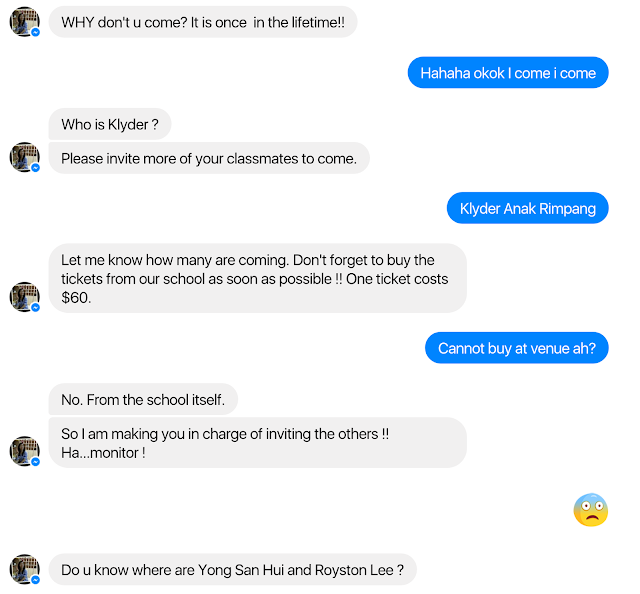 I did try to initiate with my secondary classmates to see if any of them were planning on attending but many of them were on the fence about it so my final thought was to just give it a miss. That is until I got the most random Facebook message from my primary 4 class teacher, Ms Wong, whom I have not seen for at least the past 10 years. When I first got notified via Messenger, I definitely drew a blank with her name. First thought was - I'm pretty sure I'm getting a scam message from some China girl who thinks she could trick me to sending some money. But after checking out her profile picture and realising it's actually my former teacher, of course I accepted the message thinking maybe she wanted some resources or pictures to help with the celebration of the school's diamond jubilee. Boy, was I wrong! Not even a hello, how are you and went straight to the point. Hilarious message from my former class teacher. I was scheduled to be on air on Friday nights so by default, I would usually say no to any events of Friday nights but as you can see, my teacher was somewhat persistent. Lol! Didn't take much convincing for her to guilt trip me into coming. And so, just like that I went from not attending to attending the event although I was still thinking how was I suppose to get a ticket when school hours coincides with working hours. While trying to figure out the tickets, I decide to contact a few of my former classmates via Instagram and Facebook and told them about the most random message that we might get a chance to have a group photo with HRH Princess Sarah during the event. And just like that, I gotten responses from old friends whom I usually just see as "just another update feed on my social media" and started chatting away and reminisce on our primary years. Within 10 minutes or so, one of my classmates went straight to school and purchased tickets for a few of us. ended up with 15 confirmed attendees that evening. Class photo with our primary four teacher, Ms Wong. 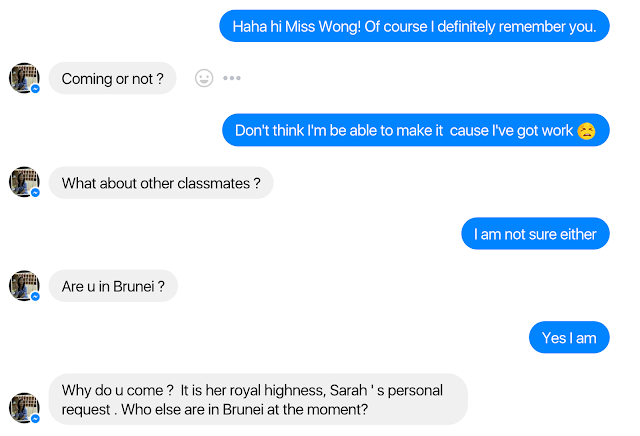 Prior to the arrival of their Royal Highnesses, we were mostly all nerves trying to figure out if we should address our former classmate as 'Your Royal Highness' or just as Sarah since that's how we knew her as. There were also many questions running through our heads mainly if she still remembered us all. 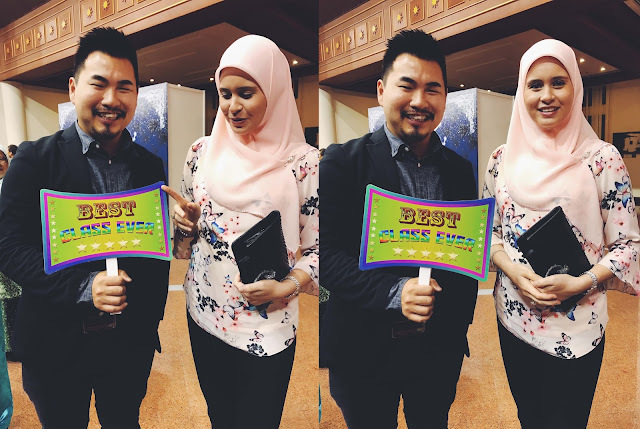 So it was quite an exciting moment reuniting with an old friend who is now part of the Brunei royal family, next in line to be the Queen of the country. Our class greeting Their Royal Highnesses. 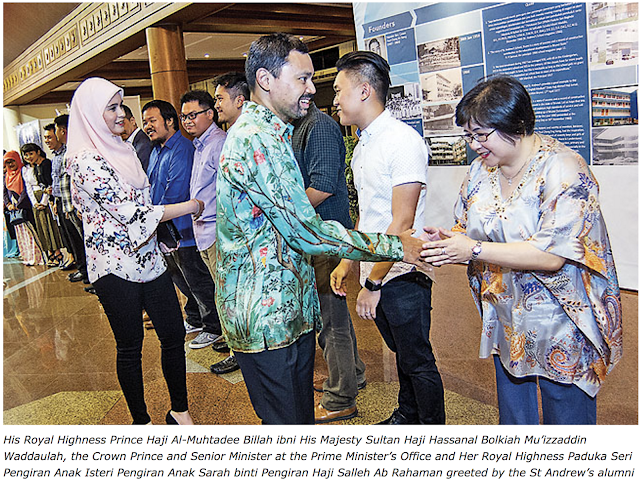 Picture courtesy of Borneo Bulletin. "Hi Ron. You haven't changed a bit." 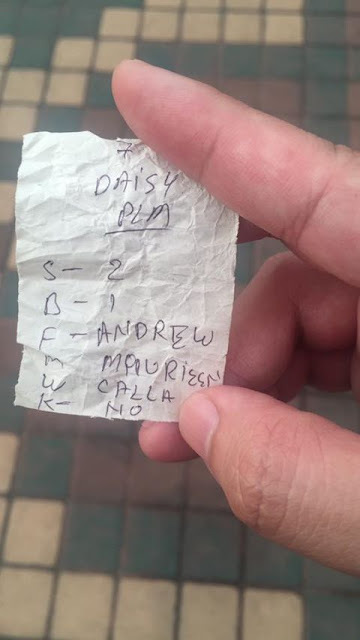 To which I just smiled nervously as she moved on and shook the rest of our classmates. I mean what else was I suppose to say to her? My knee jerk reaction was to say "You too!!" but thank goodness I just bit my tongue. 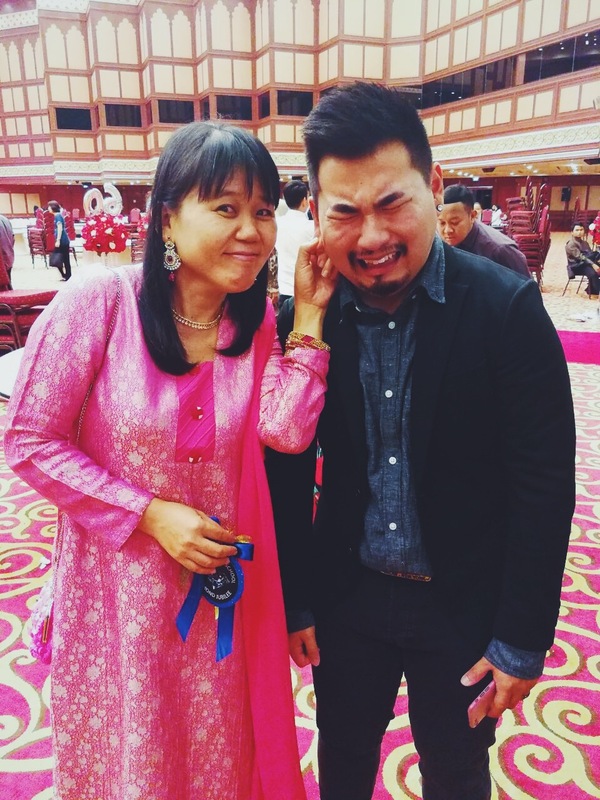 Despite not seeing her for more than a decade, we were all still delighted that she remembers all of us by name and even asked about a few of our classmates who weren't there. As the evening unfolded, most of us had great chats catching up with each other on where we are in life at the moment. 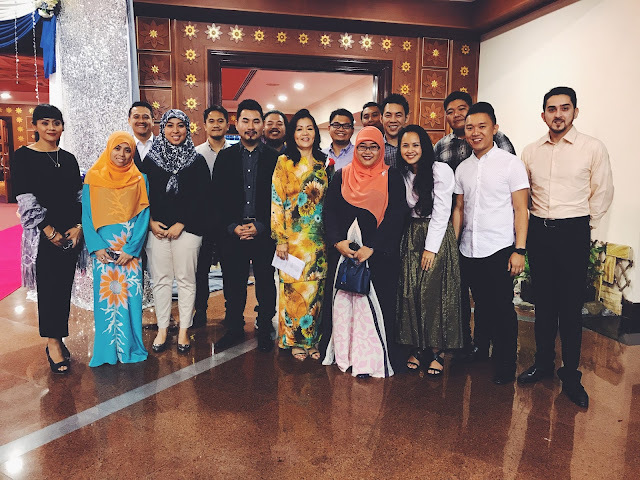 At the same time we were also updating those who couldn't make it that evening in our newly formed Whatsapp group chat with pictures and everyone definitely felt nostalgic. At the end of the night, many of us agreed that we'll need another proper reunion amongst ourselves with more attendees. So that is in the plans for now. 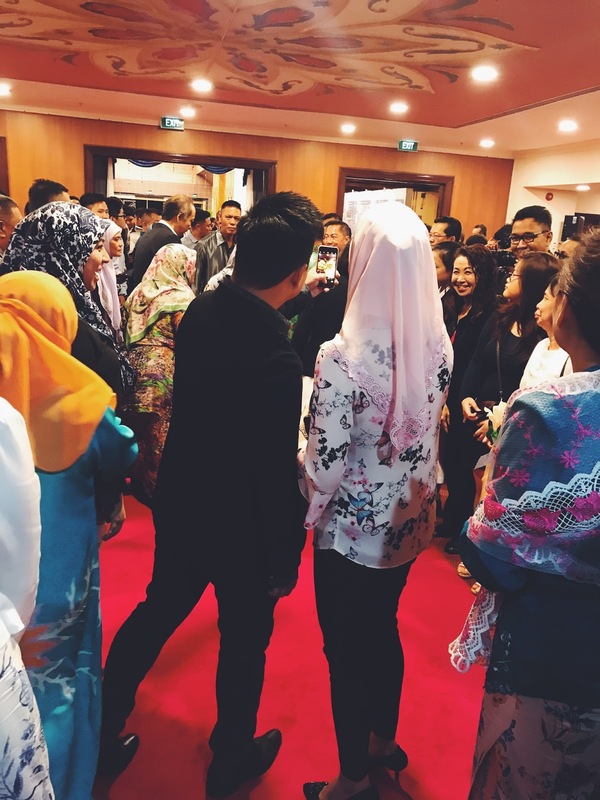 Towards the end of the evening, as both their Royal Highnesses made their way out of the building, everyone had the chance to take a selfie with them. Given that this is my first time doing this, I was an absolute wreck and completely missed out on my chance to take a selfie with the Crown Prince of Brunei! But I definitely did not want to miss my chance to take a selfie with a former classmate, after all this was what we were here for. As she made her way towards me, I was all jitters and went absolutely blank. All I remembered was giving her a big smile and said "HI!!" to which she smiled and said something along the lines of how our classmates still looked the same. Back view shot taken by a friend of me and HRH Princess Sarah taking a selfie. I had one shot and this was the result. A blurry shot of me and a princess because my hand just couldn't stop shaking. Epic fail. I was a wreck. Full of nerves and my hands just couldn't stop shaking as I was trying to tap on the button. Two of my other classmates were there and they just burst out laughing. We re-grouped outside and managed to grab another class photo again with her and this time it was much more relaxed as we were able to converse with her a little more. Of course I didn't want to miss out on my final chance to grab a proper non-blurry photo with her, so this time around I asked another classmate of mine to take a picture. Silly me have no idea why I decide to hold a sign that says 'Best Class Ever' when it was only me and her taking a photo. That moment when she asked "Why are you holding a sign that says Best Class Ever when it's only us?" Another epic fail on my part. Eventually we all said our goodbyes and the entire class a good laugh about the evening. 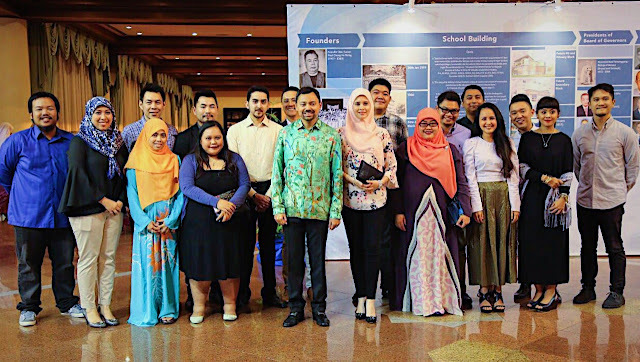 Few of us stayed behind and chatted more, while others decided to hunt down for former teachers to chat and selfie with. 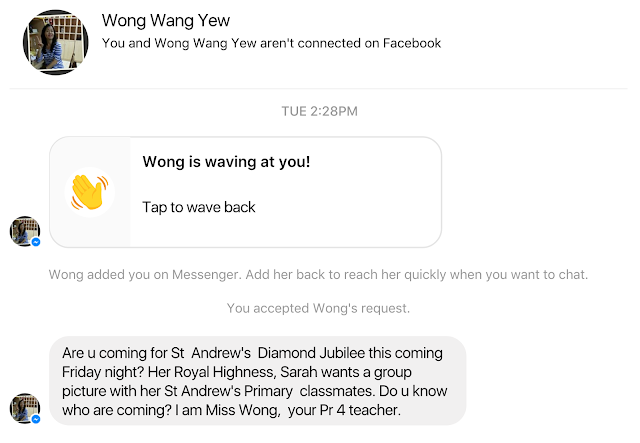 At the end of the night, I was actually glad I decided to attend St Andrew's School Diamond Jubilee celebration because the next celebration is most likely going to be the Platinum Jubilee i.e the 70th Anniversary Celebration or possibly the 75th Anniversary Celebration. By then, I'm not even sure if I'll still be able to see my teachers who once taught me. Given that quite a few has already retired and left the school this time around, it was definitely the best last minute decision I've ever made to attend this event. With Ms. Agnes, my Form 1 - 3 class teacher who have not aged. "With Courage & With Love"